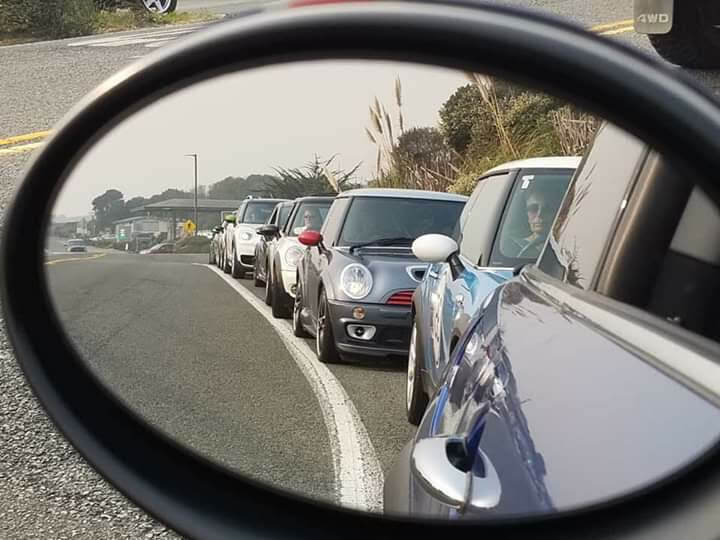 We started bright and early at Mini of Steven's Creek with 21 minis. There was a group photo of all of us holding our donation for Toys for Tots. 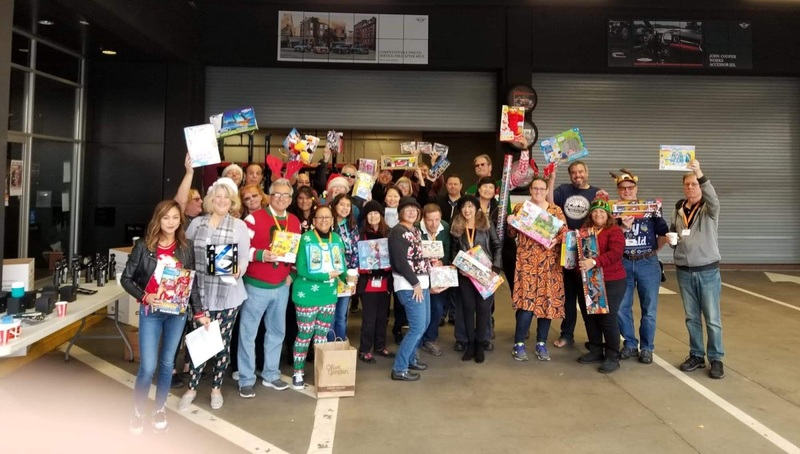 Huge THANK YOU to everyone for loading up the collection barrels with toys for the kids! And Thank you to Mini of Steven's Creek for offering breakfast and swag. We headed up Interstate 280 for a while and then taking the back-roads through highway 84, where the conditions were foggy and slippery. On highway 84, there were 2 hairpins and lots of twists. We saw joggers, walkers and even a large bicycle group who waved at our mini convoy. As we approached highway 92, the sun started to stream out through the clouds and our run became smoother. Driving on 280 traffic became congested as we merged from highway 380. We were able to keep together on highway 35, until we came to the beach by the Great Highway in San Francisco. Someone blurted out "windmills, just like in Solvang". Two windmills and the infamous Cliff house. When driving on Geary Blvd, we became separated by the traffic lights. As we approached Mini of San Francisco, all of the Motoring advisors came out to greet us as we drove past Mini of San Francisco. Thank you to Mini of San Francisco for offering the grand prize swag for our giveaway. Past the San Francisco City Hall, we were able to see the following: Sales Force building, Transbay terminal, San Francisco skyline, and the Bay Bridge, to name a few. As we approached the edge of Chinatown, we were able to form half of our group. Even though we were separated by traffic lights and stop signs, we all had fun. As we headed towards our last resting stop in the Marin Headlands, we managed to come together as one unit when we met part of our group who had taken the scenic route. We took a group photo and we conducted raffle prize drawings. The lucky winner had won a Mini Penny skateboard. Our final stop, we enjoyed brunch at Sam’s Anchor Cafe in Belvedere Tiburon. For some great photos and videos click on the link below. UPDATE TO OUR HOLIDAY RUN!! Being that it is the SEASON TO BE JOLLY... and to get into the spirit of the holidays... Instead of wearing our normal MINI logo t shirts and hats. Dust it off and wear your UGLIEST SWEATER proudly.. And anything else everyone can come up with for fun on this great day! Let’s gather to join in on the fun driving to see the sights from a MINI perspective. This is a NorCal MINIS paid members event only. We shall start from MINI of Stevens Creek and have some bagels, yogurt, and coffee. Visit some back roads and highways to see the San Francisco beach, windmills, City Hall, Ferry building, edge of Chinatown, Golden Gate Bridge, Palace of Fine Arts, Marin headlands and Tiburon. Cash or credit card is accepted at parking lot exit. We met at 9:00 am at Philz Coffee in the Corte Madera Town Center. We had 32 cars. It was a smoky day due to the fires in Paradise, but we decided to forge ahead. After leaving Philz we headed back south down 101 to Highway 1 through Mill Valley. We took some side streets through Mill Valley neighborhoods onto Panoramic Highway. The views were beautiful but not as good as they would have been without the smoke. We arrived on highway 1 in Stinson Beach and headed north on highway1. We were in two groups but managed to catch up and become one large group once on Highway 1. We followed highway 1 through to Point Reyes Station where we made an impromptu stop at Point Reyes Vineyards. We were able to taste a few sparkling wines and purchase if we wanted to. The proprietor opened early for us and allowed us to use both his restrooms to get everyone accommodated. We headed back north onto highway 1 through Tomales Bay and the small town of Tomales up to Bodega Bay where we stopped at The Tides for lunch. We were there for about 2 hours when the run officially ended. After the run Simon led the group who elected to go on a drive around Bodega Bay for some photo opportunities. After that he led the remaining group who elected to go to a wine tour and tasting at Fort Ross Vineyards about 30 minutes north of Bodega Bay. On a gorgeous fall morning, Simon led a caravan of Minis from a San Jose Starbucks to a Salinas Starbucks where Vickie and Mick would meet up and lead the group on our October run to Harris Ranch. With a total of 19 Mini Coopers ready and raring to go, we headed toward the lush Salinas Valley famously known as the “Salad Bowl of the World” and watched the agriculture industry hard at work. As we traveled down River Road we passed fields of lettuce, strawberries, cauliflower and prickly pears, among others. We then passed through the Santa Lucia Highlands appellation with rows of vineyards starting to change to their autumn colors. We passed by the Soledad Mission and then headed to the other side of the valley to continue south on Metz Road. The Gabilan side provided another vantage point to see where our vegetables come from. After a quick stop in King City we regrouped to head south on Highway 101 before taking Highway 198 to Coalinga and Harris Ranch. With the exception of one impatient, dangerous idiot that passed our group crossing the double yellow lines, it was a fantastic drive. We arrived at Harris Ranch and were able to park together and display our new club flag, signifying that NorCal Minis had arrived. A delicious lunch was held in the Ranch Kitchen Restaurant and then we met up back at the cars for some prize drawings, with lucky winners taking home bottles of chardonnay from the wine area we had just traveled through. 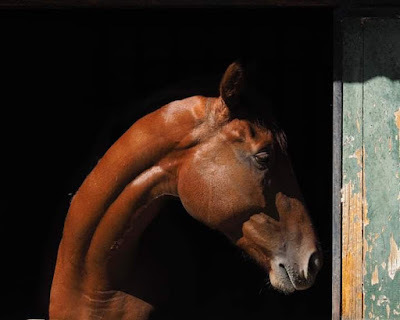 Most of us took the short drive over to the Harris Farms Horse Division and were given an informative tour of the property and breeding barn by their employee, Lucinda. The Thoroughbreds were beautiful and stately and watching the young horses run was pure magic. After the tour, some members headed home but a few took advantage of the discounted room rate and the resort feel of the Harris Ranch Inn, relaxing by and in the pool before dinner. Being a large group we were again seated in the Ranch Kitchen for dinner where we could order copious amounts of steak and drink wine from Mick and Vickie’s cellar, but that was probably a good thing because our group can get a little boisterous while having fun. A few diehards ended the evening at the hot tub for a nightcap, closing the chapter on another successful NorCal Mini run. Check out the link below to all the great photos from the day. The Highway 1/ Bodega Bay run is approaching and remember we moved the date from November 3rd to November 10th. From there will we head south down Highway101 and hop onto Highway 1. We will drive through the hills on Highway 1 until we get to the coast. We will follow the coast north on Highway 1 until we get to Bodega Bay for lunch. We are not eating at the sit down restaurant but you can order your lunch at the snack bar walk up window. Which is located around the corner from the gift shop. Opposite end of the dine in restaurant. Plenty of seating indoors and out. Go straight onto Almonte Blvd. which turns into Miller Ave. Turn LEFT onto Montfort Ave. from the 4 way stop on Miller Ave. Turn RIGHT onto Molino Ave. Turn LEFT onto Edgewood Ave. NOTE: Some of these streets are in a residential neighborhood. There are cars, bikes and people on the roads parked and moving. NOTE: GPS is off and on in those hills. Radios should work – please stay CLOSE and keep in radio contact for updates on turns or roads should there be a road issue determined by the lead car.